The best alternative for you to capture and edit videos easily on all platforms. 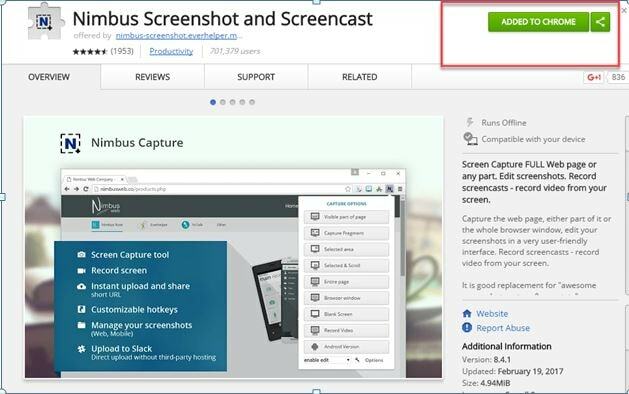 Nimbus Screen Capture Tool is an impressive solution to your screen recording needs that has amazing interface and serves with feature rich platform. This software can easily capture screen shots of entire web screen as well as your selected area on screen. Further the recorded screenshots can be edited to create customized results. The excellent editor tool assists users in fast personalization of videos with effective blur, write, draw and crop tools. It allows users to work with free hand pen tool or one can also select a line tool as per need. Other then this rectangles, circles and arrows can be easily added to images. The keyboard shortcuts are supported and the results can be easily save din different popular formats like BMP, PNG and JPG etc. You can save recordings directly to Google Drive or can send them to printer for hardcopy. While saving captured details, the software itself asks users that whether they want to save it directly or want to edit, if you hit the edit option then image will directly open with its editor tool. It provides five types of screenshots: Blank shot, entire screen, entire page, selected area and the visible portion of page. This software tool is available for Opera Explorer, FireFox and Chrome users. The editing features are much useful, users can customize screen shots with much finer details. Keyboard shortcuts are activated on its interface. The screen recording feature is accessible to Chrome users only. During video recording it can crash anytime creating huge loss of data. It consumes too much time for saving recorded files to your specified storage place. 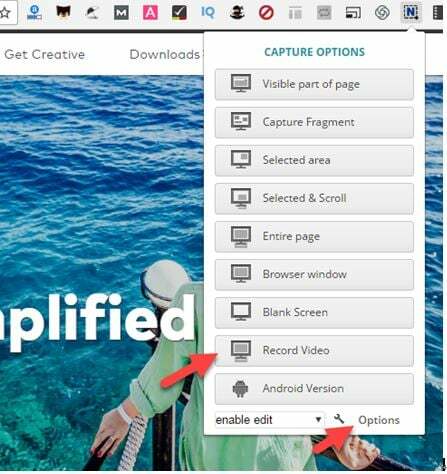 How to Use Nimbus Screen Capture Tool? Step 1: Go to Opera, Chrome or FierFox and download your add on. Note that the screen recording feature is accessible to Chrome users only. Step 2: Search for Nimbus Screencast and Screenshot, add it to the chrome. Step 3: A small logo is available on the top right corner of your Chrome, click on it. Step 4: Now from available toolbar on the top portion of screen you can select capture screen shot option or record video as per need. Step 5: The integrated tools can be used to edit captured screenshot. 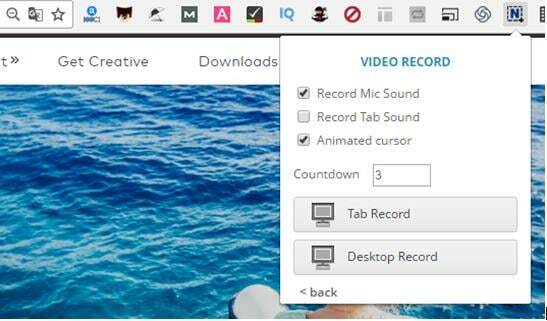 Step 6: In case if video recording you can make selection between desktop record and tab record as per need. Step 7: Once your recording is finished then hit the Stop recording button. This browser based screen recorder tool is much easier to install and can be easily operated by beginners. There is no need of additional application or storage but this software is not much stable. It can crash anytime in between your recording process. Further, the recorded videos are not so smooth like other competitive tools. If you want to save your time and work with a stable as well as user friendly desktop recorded software then it is good to switch to Filmora. It comes with all impressive editing features and can be accessed for free. There is no specific time limit for recording videos with Filmora and you will not even get any watermark on resulting files. Professionals recommend Wondershare Filmora as best alternative for Nimbus Screen Capture tool.